Schaffhausen ( [ˈʃafˌhauzən]; Alemannic German: Schafuuse; French: Schaffhouse; Italian: Sciaffusa; Romansh: Schaffusa; English: Shaffhouse) is a town with historic roots, a municipality in northern Switzerland, and the capital of the canton of the same name; it has an estimated population of 36,000 as of December 2016. It is located right next to the shore of the High Rhine; it is one of four Swiss towns – besides Neuhausen a. Rhf., the historic Neunkirch and Stein a. Rh. – that is located on the northern side of the Rhine. The old portion of the town has many fine Renaissance era buildings decorated with exterior frescos and sculpture, as well as the impressive old canton fortress, the Munot. Schaffhausen is also a railway junction of Swiss and German rail networks. One of the lines connects the town with the nearby Rhine Falls in Neuhausen am Rheinfall, Europe's largest waterfall, a tourist attraction. The Reformation was adopted, initially, in 1524 and completely in 1529. The town was heavily damaged during the Thirty Years' War by the passage of Swedish (Protestant) and Bavarian (Roman Catholic) troops and the very important bridge was burnt down. It was not until the early 19th century that the arrested industrial development of the town made a fresh start. In 1857 the first railroad, the Rheinfall-Bahn running from Winterthur, reached Schaffhausen. 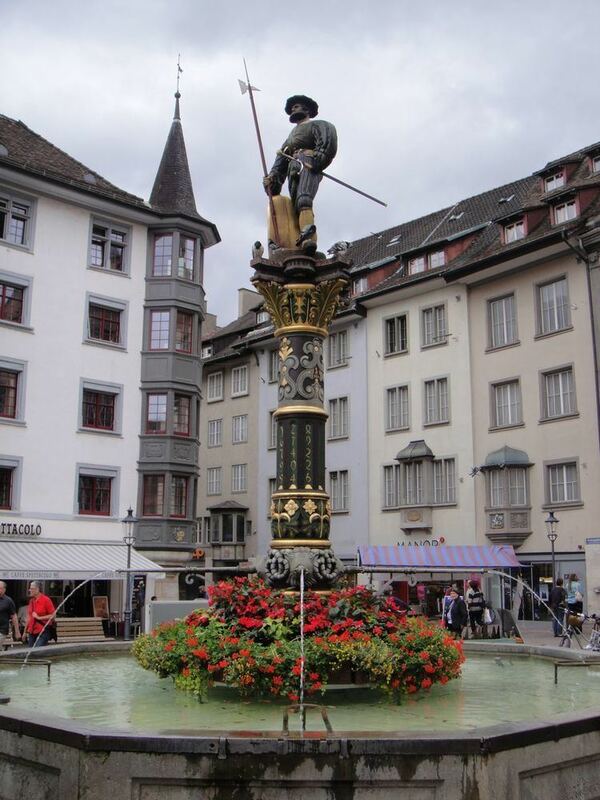 Schaffhausen is located in a finger of Swiss territory surrounded on three sides by Germany. On 1 April 1944 Schaffhausen suffered a bombing raid by United States Army Air Forces aircraft which strayed from German airspace into neutral Switzerland due to navigation errors. About a hundred civilians were killed; the United States quickly offered four million dollars in reparations. The town of Schaffhausen stands on the right bank of the river Rhine. It has an area, (as of the 2004/09 survey) of 41.86 km2 (16.16 sq mi). Of this area, about 20.2% is used for agricultural purposes, while 53.4% is forested. Of the rest of the land, 24.8% is settled (buildings or roads) and 1.6% is unproductive land. Over the past two decades (1979/85-2004/09) the amount of land that is settled has increased by 95 ha (230 acres) and the agricultural land has decreased by 117 ha (290 acres). As of 2017, Schaffhausen's City Council is made up of one representative of the SP (Social Democratic Party, who is also the mayor), one representative of the AL (Alternative List), one of the FDP (The Liberals), one of the SVP (Swiss People's Party), and one of the GLP (Green Liberal Party), giving the right parties a majority of three out of five seats. The last regular election was held on 28 August 2016. 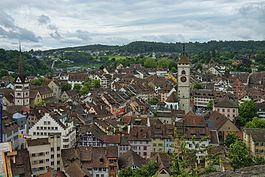 Schaffhausen has a population (as of December 2016) of 36,148. As of 2014, 27.9% of the population are resident foreign nationals. Of the foreign population, (as of 2008), 21% are from Germany, 13.3% are from Italy, 8.8% are from Croatia, 13.3% are from Serbia, 6% are from Macedonia, 9% are from Turkey, and 28.6% are from other countries. Most of the population (as of 2000) speaks German (84.3%), with Serbo-Croatian being second most common (3.4%) and Italian being third (3.2%). As of 2014, children and teenagers (0–19 years old) make up 17.8% of the population, while adults (20–64 years old) are 61.7% and seniors (over 64 years old) make up 20.5%. In 2015 there were 15,288 single residents, 15,287 people who were married or in a civil partnership, 2,119 widows or widowers, 3,253 divorced residents and 1 people who did not answer the question. In 2014 there were 16,723 private households in Schaffhausen with an average household size of 2.10 persons. Of the 5,863 inhabited buildings in the municipality, in 2000, about 51.5% were single family homes and 29.7% were multiple family buildings. Additionally, about 22.1% of the buildings were built before 1919, while 7.6% were built between 1991 and 2000. In 2013 the rate of construction of new housing units per 1000 residents was 1.29. The vacancy rate for the municipality, in 2015, was 0.71%. As of 2000, 27.4% of the population belonged to the Roman Catholic Church and 43.6% belonged to the Swiss Reformed Church, later organized in the parish St. Johann – Münster. In Schaffhausen about 69.8% of the population (between age 25-64) have completed either non-mandatory upper secondary education or additional higher education (either university or a Fachhochschule (university of applied sciences)). 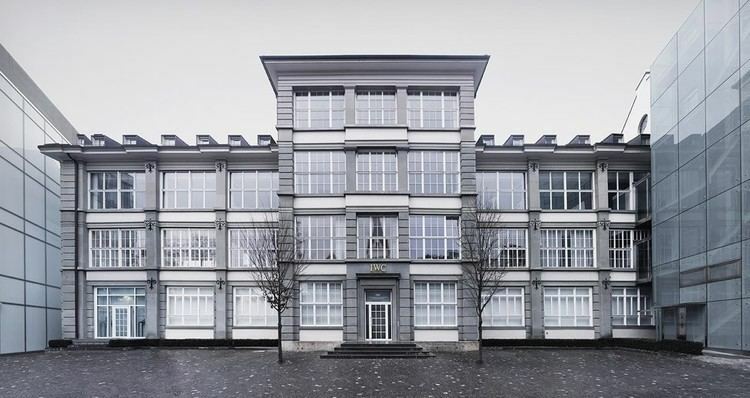 In Schaffhausen, as of 2007, 1.73% of the population attend kindergarten or another pre-school, 5.65% attend a Primary School, 2.98% attend a lower level Secondary School, and 2.49% attend a higher level Secondary School. As of 2013, there were a total of 25,749 people employed in the municipality. Of these, a total of 103 people worked in 24 businesses in the primary economic sector. A majority (61.2%) of the primary sector employees worked in very small businesses (less than ten employees). The remainder worked in 2 small businesses with a total of 40 employees. The secondary sector employed 6,403 workers in 371 separate businesses. In 2014 a total of 2,433 employees worked in 358 small companies (less than 50 employees). There were 13 mid sized businesses with 1,631 employees and 3 large businesses which employed 2,333 people (for an average size of 777.7). Finally, the tertiary sector provided 19,243 jobs in 2,626 businesses. In 2014 the tertiary sector numbers had increased by 606 and 20 respectively. In 2014 a total of 12,890 employees worked in 2,597 small companies (less than 50 employees). There were 45 mid sized businesses with 4,938 employees and 4 large businesses which employed 2,021 people (for an average size of 505.3). In 2015 local hotels had a total of 102,537 overnight stays, of which 52.6% were international visitors. In 2015 there were two movie theaters in the municipality, with a total of 10 screens and a total of 1,816 available seats. As of 2008, there are 102 restaurants, and 11 hotels with 445 beds. The catering industry in Schaffhausen employs 924 people. Schaffhausen hosts some well-known industrial companies like Georg Fischer (piping systems, machine tools and automotives), an internationally reputed manufacturer of watches (IWC), pharmaceutical industry (Cilag, founded by Bernhard Joos) and BB Biotech (biotechnologies). Tyco International and Garmin are also incorporated in Schaffhausen. There is also the Shotokan Karate Klub Schaffhausen, one of the oldest Karate Clubs of Switzerland.